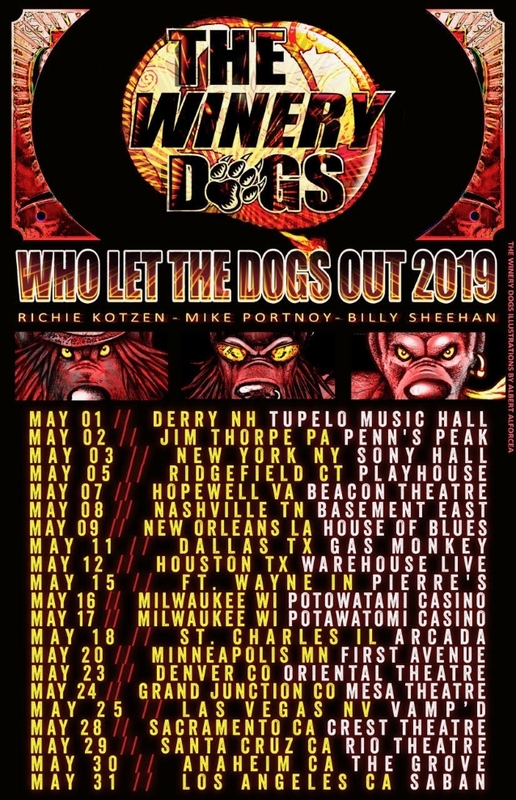 THE WINERY DOGS — the hard rock power trio featuring guitarist/vocalist Richie Kotzen (POISON, MR. BIG), bassist Billy Sheehan (MR. BIG, DAVID LEE ROTH) and drummer Mike Portnoy (SONS OF APOLLO, DREAM THEATER) — will embark on an American tour in May of 2019. The trek will mark the group's first tour in nearly three years.Tour dates:May 01 - Derry, NH - Tupelo Music HallMay 02 - Jim Thorpe, PA – Penn's PeakMay 03 - New York, NY - Sony HallMay 05 - Ridgefield, CT - Ridgefield PlayhouseMay 07 - Hopewell, VA - Beacon TheaterMay 08 - Nashville, TN - Basement EastMay 09 - New Orleans, LA - House Of BluesMay 11 - Dallas, TX - Gas MonkeyMay 12 - Houston, TX - Warehouse LiveMay 15 - Ft Wayne, IN - Pierre'sMay 16 - Milwaukee, WI - Potowatami CasinoMay 17 - Milwaukee, WI - Potowatami CasinoMay 18 - St Charles, IL - Arcada TheaterMay 20 - Minneapolis, MN - First AvenueMay 23 - Denver, CO - Oriental TheaterMay 24 - Grand Junction, CO - Mesa TheaterMay 25 - Las Vegas, NV - Vamp'dMay 28 - Sacramento, CA - Crest TheaterMay 29 - Santa Cruz, CA - Rio Theater May 30 - Anaheim, CA - The GroveMay 31 - Los Angeles, CA - Saban TheaterSince wrapping up an extensive world tour in support of their sophomore album, "Hot Streak", in the summer of 2016, THE WINERY DOGS have performed live on just two occasions — during the inaugural "Monsterwood" West Coast edition of the Monsters Of Rock cruise in the fall of 2016, and nearly a year later during an "Ultimate Jam Night" tribute to late ADRENALINE MOB, SOTO and TRANS-SIBERIAN ORCHESTRA bassist David Zablidowsky at the Whisky A Go Go in West Hollywood, California. Over the past two years, each of the members of THE WINERY DOGS have toured extensively with other acts — Kotzen with his long-running solo band; Sheehan with SONS OF APOLLO and MR. BIG; and Portnoy with SONS OF APOLLO, THE NEAL MORSE BAND and SHATTERED FORTRESS. THE WINERY DOGS were founded in 2012 after Portnoy and Sheehan — who initially aimed to collaborate with former Whitesnake and BLUE MURDER guitarist John Sykes — reached out to Kotzen, who played with Sheehan in MR. BIG from 1997 to 2002. The group's 2013 self-titled debut reached No. 27 on the Billboard 200 after selling more than 10,000 copies in the U.S. during its first week of availability. The initial sales of "Hot Streak" were even better, as the album debuted at No. 30 in late 2015 after shifting 13,000 equivalent album units in America during its first week of availability. Despite the band's success, Kotzen expressed a desire to return to his solo career after the end of the "Hot Streak" touring cycle. "I wanted to go back to what I was doing my whole life, which is making my music and my records," he said during an appearance on the satellite radio program "Trunk Nation" earlier this year. He reiterated that sentiment during a subsequent interview with Sofa King Cool. "I thought in my mind, 'Well, this worked. It was fun. It was really cool. But I kind of want to go back to being Richie for a while and doing what I was doing before,'" he said. For their parts, Sheehan and Portnoy both publicly voiced hope that THE WINERY DOGS' hiatus would be short-lived. In an interview with "The Unchained Rock Show" this summer, Sheehan called THE WINERY DOGS his "favorite band." "I love THE WINERY DOGS," he said. "Richie wanted to do some [other] things, and we wanted to give it a break for a while so it didn't get stale, and it would be new to us all the time. We will do more WINERY DOGS for sure. "Portnoy, meanwhile, told Mitch Lafon this spring that "it's just a matter of when" until the group would reconvene. "I know all three of us love that band and we love working together, so it's a matter of Richie kind of just getting his rocks off on his own," he said. "He's just enjoying doing his own thing. He's always been a little… um… I don't wanna say 'scared'… I'll say, like, 'hesitant' to commit to a full-time band for the rest of his life. He spent so much of his life and career as a solo artist, and then once he got swept up in THE WINERY DOGS for two back-to-back cycles, which lasted maybe four or five years, I think it maybe overwhelmed him a bit and he just needed to step away and breathe and not have to be so committed to something. He likes to kind of just float on his own terms and his own schedule and do his own thing, which I can totally respect. So, at this point, when he's ready, I know Billy and I would love to do some more."